Shelf Actualization: No Other Writer? It’s a bold statement, but I suppose I cannot disagree with Arthur. Of all the greats (Faulkner, Stegner, Twain, Joyce, Fitzgerald, Woolf, and now McCarthy), there is simply no writer whose writing and personal life have drawn me in quite like old Ernest. Now granted, I have a love affair with Spain, so that gives Hemingway a leg-up over the competition. I’ve been to Pamplona and Paris and Ketchum, Idaho. I’ve read books about the Spanish Civil War, attended bullfights, and done some deep-sea fishing. So I understand Ernest from that perspective. It’s stark and bare, and in case you don’t recognize it, it’s quite simply the first paragraph of “A Farewell to Arms.” And perhaps it’s language such as this which allows us to confidently say that Ernest Hemingway seems to hold our interest, and inspire imitation, in ways other writers do not. Oh, no! Hemingway love already! I think his appeal to writers is simple: it seems pretty easy to copy his style. It's simple, short, brief; seems fairly easy to copy. Faulkner on the other hand seems less accessible both to readers and writers. It's hard to imitate his maximalist style. Also, I think Hemingway's "persona" is lame. He loved his carefully crafted image of a "man's man", but it always seems like barely hidden insecurity to me. 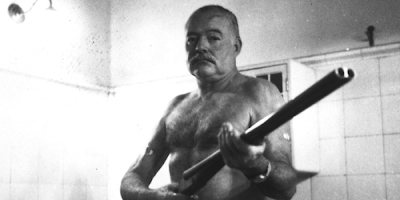 Don't get me wrong, I like a lot of Hemingway's writing, but I would hardly say that I find his writing MORE appealing because of his personal life, or that I gravitate to his writing more than others (like Faulkner or Fitzgerald). Plus, he's a huge misogynist. Why does he hold our interest? Maybe because he posed shirtless for portraits of him wielding a shotgun in the bathroom. Well Orlando . . . perhaps you should call Mr. Phillips at the NY Times and tell him that he mistaken.